Have you always dreamed of having a career in fashion? Don’t know where to start? Now you do! 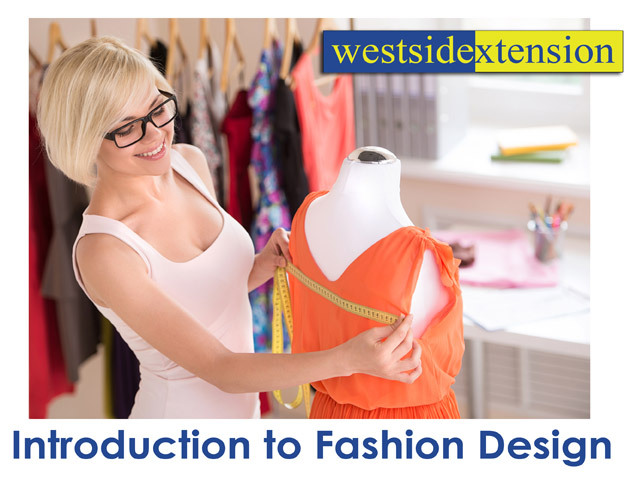 This course explains the principles of fashion design, sharing with students the qualities and tools necessary to become successful in the world of fashion. Learn about the business of fashion including the fashion cycle, trend forecasting, and market segments–along with fabric/textile fundamentals, how to formulate a sketch, and how to build a collection. You’ll also make a brief exploration into the many careers available in fashion, establish the contents of a strong portfolio, and earn a certificate if you successfully complete class. So come follow your dream! Krystal Ellis has a fashion design degree from the Art Institute of Dallas and has worked in the fashion industry for the past 10 years for retail powerhouses like Nordstrom, Bebe, JC Penney, Dilliards, and Kohl’s. Brands she’s designed for and helped launch include Kouture by Kimora (Lee Simmons) and Madonna’s Material Girl line. Find out how the “fashion cycle” works from design to distribution, manufacture and marketing. Includes identifying market segments, color and style forecasting, trade shows, sales analyses, and the production process. Also dispel myths about fashion. Learn the basic principles of fashion and elements of design - including line, silhouette, proportion, and texture. Discover how to use these elements for effect and how fabric choice can impact design. Explore and identify the many types of sleeves, cuffs, and necklines as well as the variety of jackets, skirts, and pants along with fit and use of trims. An overview of the variety of jobs available in the fashion industry and the paths to getting them, from prerequisites for the various segments of the industry to tips for climbing up the ladder. (Hint: you’ll sound more “in the know” because you took this course). Look at successful designers and design houses to determine the keys to success in fashion, then develop your own personal fashion “game plan.” Also turn in your fashion project to receive a certificate that shows you are knowledgeable about your industry and dedicated to your craft. Note: project is cumulative and can only be completed by students who attend all six classes.